The evolution of Unmanned Aircraft Systems (UAS) over the most recent 20 years has seen an impressive rate of innovation. The time between a new technology first appearing in academia and being available in a consumer product can be very short compared to typical aerospace applications. Throughout this period, the navigation, guidance, and control challenges in UAS have been among the most significant barriers to wider use. That remains true today. This talk will reflect upon past work at Draper and Georgia Tech, and lessons learned about which technologies have “made it” and perhaps why. Specific highlights include one of the first small GPS-navigated helicopters, fault-tolerant control results, and the automatic transition of an airplane to/from tail-sitting hover. Later work includes sensing and avoiding other aircraft and obstacles, navigation without reliance on Global Positioning Satellite systems (GPS), and multi-aircraft cooperative autonomy. This will include progress in both theory and related flight test validation. The talk will conclude with some speculation about the next “wave” of UAS guidance, navigation, and control theory and technology that will be significant – and perhaps where academic research can best contribute. The history of adaptive control systems dates back to early 50-s, when the aeronautical community was struggling to advance aircraft speeds to higher Mach numbers. In November of 1967, X-15 launched on what was planned to be a routine research flight to evaluate a boost guidance system, but it went into a spin and eventually broke up at 65,000 feet, killing the pilot Michael Adams. It was later found that the onboard adaptive control system was to be blamed for this incident. About thirty years later, fueled by advances in the theory of nonlinear control, Air Force successfully flight tested the unmanned unstable tailless X-36 aircraft with an onboard adaptive flight control system. This was a landmark achievement that dispelled some of the misgivings that had arisen from the X-15 crash in 1967. Since then, numerous flight tests of Joint Direct Attack Munitions (JDAM) weapon retrofitted with adaptive element have met with great success and have proven the benefits of the adaptation in the presence of component failures and aerodynamic uncertainties. However, the major challenge related to stability/robustness assessment of adaptive systems is still being resolved based on testing the closed-loop system for all possible variations of uncertainties in Monte Carlo simulations, the cost of which increases with the growing complexity of the systems. This talk will give an overview of the limitations inherent to the conventional adaptive controllers and will introduce the audience to the L1 adaptive control theory, the architectures of which have guaranteed robustness in the presence of fast adaptation. Various applications, including flight tests of a subscale commercial jet, Learjet and F16, will be discussed during the presentation to demonstrate the tools and the concepts. With its key feature of decoupling adaptation from robustness L1 adaptive control theory has facilitated new developments in the areas of event-driven adaptation and networked control systems. A brief overview of initial results and potential directions will conclude the presentation. Naira Hovakimyan received her MS degree in Theoretical Mechanics and Applied Mathematics in 1988 from Yerevan State University in Armenia. She got her Ph.D. in Physics and Mathematics in 1992, in Moscow, from the Institute of Applied Mathematics of Russian Academy of Sciences, majoring in optimal control and differential games. Before joining the faculty of UIUC in 2008, she spent time as a research scientist at Stuttgart University in Germany, at INRIA in France, at the Georgia Institute of Technology, and she was on faculty of Aerospace and Ocean Engineering of Virginia Tech from 2003 to 2008. She is currently a W. Grafton and Lillian B. Wilkins Professor of Mechanical Science and Engineering at UIUC. In 2015 she was named inaugural director for Intelligent Robotics Lab of CSL at UIUC. She has co-authored two books, six patents and more than 350 refereed publications. She was the recipient of the SICE International scholarship for the best paper of a young investigator in the VII ISDG Symposium (Japan, 1996), the 2011 recipient of AIAA Mechanics and Control of Flight award and the 2015 recipient of SWE Achievement Award. In 2014 she was awarded the Humboldt prize for her lifetime achievements. In 2015 she was awarded the UIUC Engineering Council award for Excellence in Advising. She is a Fellow and life member of AIAA, a Senior Member of IEEE, and a member of SIAM, AMS, SWE, ASME and ISDG. She is cofounder and chief scientist of IntelinAir. Her work in robotics for elderly care was featured in the New York Times, on Fox TV and CNBC. Her research interests are in control and optimization, autonomous systems, neural networks, game theory and their applications in aerospace, robotics, mechanical, agricultural, electrical, petroleum, biomedical engineering and elderly care. Making small unmanned aerial vehicles more autonomous is a continuing endeavour in the UAV research community; it is also the focus of Sharf’s research. In this context, her group has been working on problems of state estimation, localization and mapping, system integration and controller design for multicopters and indoor blimps. Following a brief overview of past research projects, this presentation will focus on current work on the development of collision recovery controllers for quadcopters. The collision dynamics model and post-collision response characterization of the quadrotor are presented, followed by their experimental validation. A collision recover pipeline is proposed to allow propeller protected quadrotors to recover from a collision. This pipeline includes collision detection, impact characterization and aggressive attitude control. The strategy is validated via a comprehensive Monte Carlo simulation of collisions against a wall and a pole, showing the feasibility of recovery from challenging collision scenarios. The pipeline is implemented on a custom quadrotor platform, demonstrating feasibility of real-time performance and successful recovery from a range of pre-collision conditions. The ultimate goal is to implement a general collision recovery solution to further advance the autonomy and safety of quadrotor vehicles. Dr. Inna Sharf is a professor in the Department of Mechanical Engineering at McGill University, Montreal, Canada. She received her B.A.Sc. in Engineering Science from the University of Toronto (1986) and her PhD at the Institute for Aerospace Studies, University of Toronto (1991). 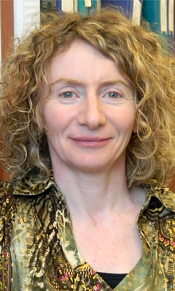 Prior to relocating to McGill in 2001, she was on faculty with the Department of Mechanical Engineering at the University of Victoria. Sharf’s research activities are in the areas of dynamics and control with applications to space robotic systems, unmanned aerial vehicles and legged robots. Sharf has published over 150 conference and journal papers on her academic research. She is an associate fellow of AIAA and a member of IEEE. The 2017 International Youth （age group: 9-17 years old）Drone Competition and Summer Camp program, co-hosted by the University of Toronto Faculty of Applied Science and Engineering (FASE) and the City of Markham, was successfully held at the University of Toronto between August 4th and 5th. 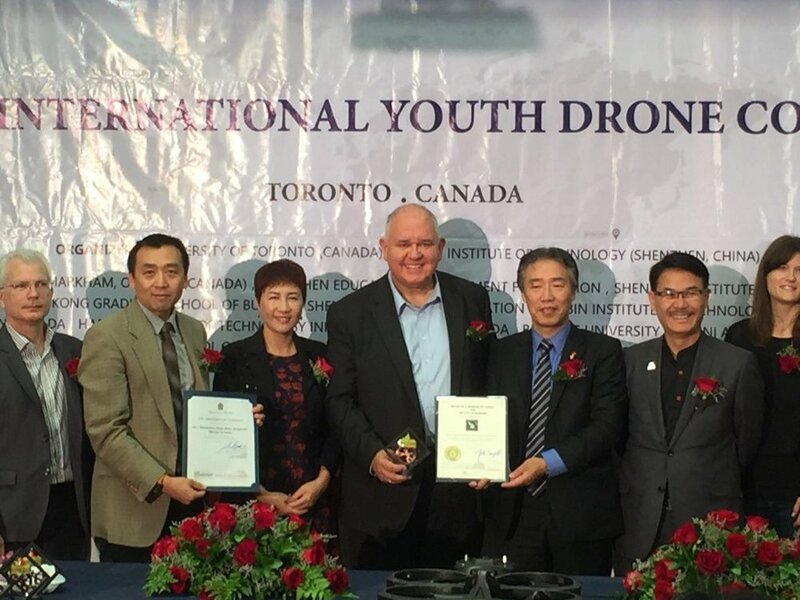 It is perhaps the very first of its kind competition in Canada targeting youth focusing on drone technology and development. It is organized by the U of T’s Centre for Aerial Robotics Research and Education (CARRE), Longing Technology Inc.China, and Merit Education Inc. Canada. The international partner is Harbin Institute of Technology (Shenzhen). The program is also supported by various organizations and individuals in Canada. 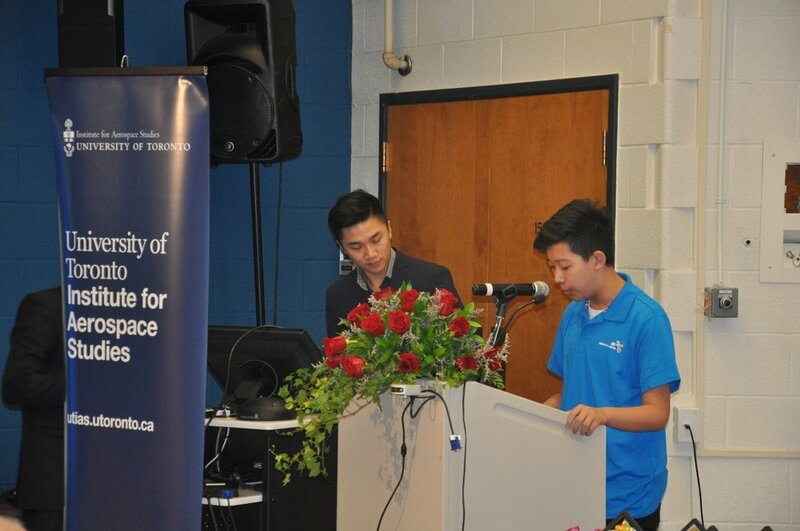 On August 4th, the opening ceremony took place at the University of Toronto Institute for Aerospace Studies (UTIAS). 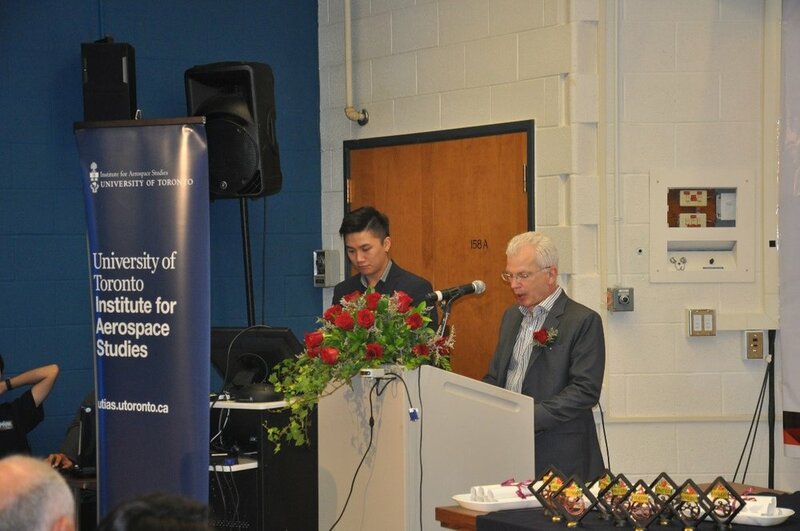 The event was attended by Mr. Frank Scarpitti, Mayor of the City of Markham, the honorary co-chair of the competition, Professor Tom Coyle, Vice Dean of FASE and Dean Cristina Amon’s designate. Dean Amon also served as the honorary co-chair. Other guests from various supporting organizations, athletes, referees, and parents joined the ceremony. Professor Hugh Liu, Director of CARRE and the chair of the organizing committee, introduced the program. The program aims at promoting STEAM education, building characters, and inspiring youth. It also encourages international exchange. 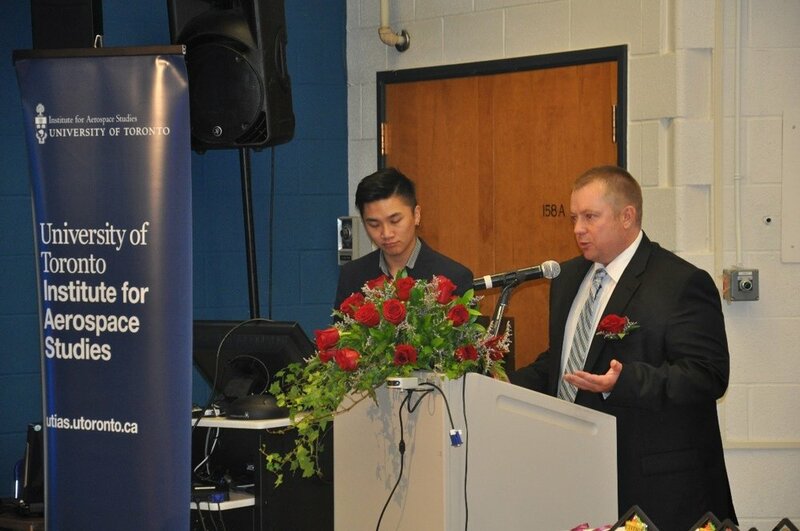 The program in Canada was announced on June 2nd at the Civic Centre, City of Markham. The final competition takes place on August 5th, at Varsity Arena, the University of Toronto. In addition, registered participants were given several trainings by the U of T’s graduate students and academic staff in July. All participants received a certificate of training, issued by FASE and CARRE, during the opening ceremony. Ms. Jingyun Bao, co-chair of organizing committee, President of Longing Inc.
Dr. Joe Lu, co-chair of organizing committee, President of Merit Education Inc. The organizing committee received a letter from Member of Parliament, Ms. Marry Ng, represented by Ms. Jane Xu, Executive Assistant to Ms. Ng. After the ceremony, UofT spin-off company, Arrowonics Technologies, performed a drone show with multiple drones in formationflight. The final competition took place at Varsity Arena on August 5th. There were total 9 teams, participating two events: hoop jumping and drone curling. After intensive competitions among teams, the winner isthe team consisting of Mr. Jonathan Lin, Janet Cheng,and Rayce E.
Prof. Dario Floreano is the Director of the Laboratory of Intelligent Systems, EPF Lausanne. Switzerland. 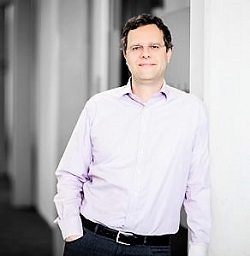 He is also Founding Director of the Swiss National Center of Competence in Robotics, which sponsors almost 60 researchers in wearable, mobile, and educational robots from 20 robotics labs across Switzerland. Prof. Floreano holds an M.A. in visual psychophysics, an M.S. in Neural Computation, and a PhD in Robotics. He held research positions at Sony Computer Science Laboratory, at Caltech/JPL, and at Harvard University. He is interested in robotics and A.I. at the convergence of biology and engineering. His research activities include aerial robotics, soft robotics, wearable robotics, and evolutionary robotics. He published more than 350 peer-reviewed articles, more than 10 patents, and 4 books on Artificial Neural Networks, Evolutionary Robotics, Bio-inspired Artificial Intelligence, and Bio-inspired Flying Robots with MIT Press and Springer Verlag. He is on the Advisory Board of Future and Emergent Technologies of the European Commission, has been a founding member of the World Economic Forum Council on robotics and smart devices, co-founder of the International Society of Artificial Life, Inc., and executive board member of the International Society for Neural Networks. He spun off two successful companies in drones (senseFly and Flyability) and a non-for-profit platform for public awareness of robotics and A.I. (RoboHub). He received his Diploma in Mechanical Engineering in 1983 and his Doctoral Degree in 1989 from ETH Zurich. He spent than one year as postdoctoral fellow at Stanford University. Back in Switzerland, he worked from 1991 to 1996 part time as R&D director at MECOS Traxler AG and as lecturer and deputy head at the Institute of Robotics, ETH Zurich. In 1996 he was appointed as professor for autonomous microsystems and robots at the Ecole Polytechnique Fédérale de Lausanne (EPFL) where he served among others as member of the direction of the School of Engineering (2002-06) and funding chairman of the Space Center EPFL. 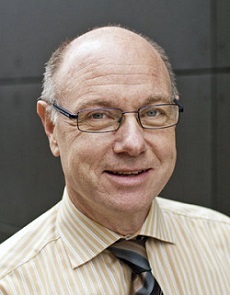 Roland Siegwart is a board member of the European Network of Robotics (EURON), and servedas Vice President for Technical Activities (2004/05) and is currently Distinguished Lecturer (2006/07) of the IEEE Robotics and Automation Society. Recently he has been appointed as Member of the Swiss Academy of Engineering Sciences and the -Bewilligungsausschuss Exzellenzinitiative- of the Deutsche Forschungsgemeinschaft (DFG).Roland Siegwart’s research interests are in the design and control of systems operating in complex and highly dynamical environments. His major goal is to find new ways to deal with uncertainties and enable the design of highly interactive and adaptive systems. Prominent application examples are personal and service robots, autonomous micro-aircrafts, walking and swimming robots and driver assistant systems. Christian Bettstetter gives an overview of research activities on networked, autonomous minidrone systems performed at the University of Klagenfurt and Lakeside Labs in Austria. He explains challenges and approaches for wireless communications, decision making, time synchronization, and system planning. He discusses these building blocks for drone-based delivery systems, search-and-rescue, and forest inventory. A new passive section approach to alleviate gust loads – the Adaptive Camber Concept – on wind turbines is introduced. The concept entails fluid-structure interaction, where flow conditions at the leading edge affect the airfoil shape. Under steady conditions, the adaptive camber airfoil de-cambers gradually with increasing angle of attack, yielding a lift curve with declined slope. The concept is investigated experimentally and numerically. Unsteady angle of attack fluctuations of various reduced frequencies are generated by means of an active grid. The adaptive camber airfoil is found to alleviate up to 60% of the fluctuating loads, while generating higher mean lift compared to a rigid airfoil. Cameron Tropea graduated from the University of Toronto in Engineering Sciences, followed by a Masters degree in Mechanical Engineering (1977). He completed his Dr.-Ing. in Civil Engineering at the Technical University of Karlsruhe (1982) and his Habilitation in Fluid Mechanics at the University of Erlangen-Nürnberg (1991) where he was appointed Professor of Fluid Mechanics until 1997. This was followed by an appointment to his current chair of Fluid Mechanics and Aerodynamics at the Technische Universität Darmstadt. Currently Editor-in-Chief of the Springer journal Experiments in Fluids and past Director of the Center of Smart Interfaces (CSI) in the period 2007-2014, his research interests include Optical Measurement Techniques in Fluid Mechanics, Interfacial Transport Phenomena, Atomization and Spray Processes and Unsteady Aerodynamics. He has recently been appointed a member of the Scientific Commission of the Council of Science and Humanities in Germany. This one-day workshop provides attendees with insight and information about planning and financing a new company, specifically in the drone / UAV / aerial robot industry, but with ideas and concepts that apply to any technology start-up. Speakers range from entrepreneurs in the early stage of operating their companies to principals of major corporations to internationally successful investors. the autonomous soaring system engaged, with three hours spent climbing in thermals. Jack Langelaan is an Associate Professor in the Department of Aerospace Engineering at Penn State University. His research focuses on path planning, control, state estimation and data fusion, applied especially to navigation, obstacle avoidance, and long-range flight of small uninhabited aircraft. He received his Ph.D. in Aeronautics and Astronautics from Stanford University in 2006; prior to Stanford he worked as an engineer at Bombardier Aerospace in Toronto, Canada.